This naturally aromatic resin of various grades comes from four main species of the slow growing and tenacious Boswellia tree, of the Balsam plant family, often growing in austere environments principally in the mountainous regions of Somalia, Ethiopia and Yemen. The milky sap is exuded by the scoring or 'striping' of its bark which then forms into the resin as softish, crystalline 'Tears'. Frankincense also known as Olibanum (from the Arabic ‘al-libãn' "that which results from milking"). In recent years this has led to the decline of the Tree by over exploitation. The origin of use of this resin for Traditional medicine and Perfumery purposes in many different cultures in history is an ancient one, and certainly goes back thousands of years. It’s no surprise to me that it's one of the oldest natural materials to be used for this and is reflected in its history going back perhaps to Man's first Religious or Spiritual practices even as being mixed in with and used in anointing oils for newborns and Initiates. There is evidence that it was adopted by ancient Egypt from being depicted in murals of Queen Hatshepsut as far back as 1458 BCE, but it's obviously older still in its origin of use. It’s also recorded in the Hebrew Bible and Talmud and the New Testament. It being one of the gifts to Jesus by the Wise men from the East needs barely commenting on but for its inner esoteric significance, Gold, Frankincense and Myrrh are all sacred to the Sun by Body, Mind and Spirit. Arcanum V (The Hierophant), an ensemble expressing the idea of the Pentagram in great detail, explains also the blazing star that led the wise men of the East to the place where the new Sun-God was born that they might worship him. Their gifts of Gold, Frankincense and Myrrh stand representative of the three worlds; Spiritual, Astral and Physical symbolised in Arcanum V by the triple Tau. Also in the Sacred Tarot, Zain assigns the rulership of Aquarius (The Sage) to Frankincense along with Myrrh and Spikenard. Aquarius being the opposite and 'balancing’ Sign to Leo in the Zodiac. Maybe it's truest value will be fully realized in the Aquarian Age, Spiritually and Medicinally. In spite of information stemming from ancient texts, constituents of Bosweilla had not been investigated for psychoactivity,” said co-author of the study Raphael Mechoulam. “We found that incensole acetate, a Boswellia resin constituent, when tested in mice lowers anxiety and causes antidepressive-like behavior. Apparently, most present day worshipers assume that incense burning has only a symbolic meaning. Frankincense Oil as well as its use in Aromatherapy as an astringent, stress reducer, a boost for the immune system and with anti-ageing properties is also being researched as to effects in the distinguishing of and use in the death of Cancer cells. Again to say it's a natural product that is safely consumed and with no reported side effects, it can indeed be chewed as with chewing gum or taken with food and aids digestive disorders too. The word Frankincense is supposed to be derived from the French 'franc encens' as meaning high quality incense, and curiously not from the fact it was introduced to Europe by Frankish Crusaders. I personally like to think that it sounds quite similar to Ankh-incense as the 'Incense of Life/creation'. I learned more than I was aware of in those days. A travelling on the Physical Plane can often lead to acquiring knowledge that can instigate, even necessitate the need to seek on the Inner Plane. Frankincense has given me so much in this respect even due to the fact that it is more of an act of doing in helping to focus on your intent and purpose. Travelling on the Inner plane is a skill that has to be slowly developed and there is also the need to be 'safe’, not only from the 'self’, the personal vulnerability of what you perceive on the Inner Plane and how you interpret your experiences, but also from the possibility of being influenced by energies and entities that may be encountered there. Frankincense offers assistance here. It clears and cleanses the atmosphere of the physical environment you are in while meditating or in attempting Astral projection. It also raises your physical senses and also your Astral senses.....'tunes you in' to the intents you may have as to what information you may be seeking on the Astral Plane and a deterrent to any possible Imponderable forces that may try to distort your character or the information that you acquire, or the understanding and interpretation of it as you return to 'normal' consciousness. 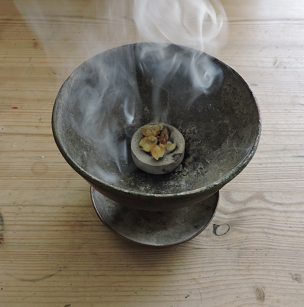 There is an 'art' or skill to Frankincense burning and it should be a personal thing that can be developed as an aid to Spiritual growth. Any vessel will do as long as it is heat/fireproof and also that will not damage the surface upon which it rests, but a simple ceramic tile can be used here. Even a small terracotta plant pot will suffice by plugging the drainage hole and then filling it with sand. It only has to be somewhat wider than one of the charcoal discs themselves. 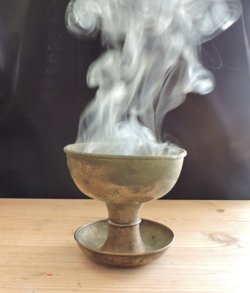 You can eventually find a 'Thurible' or other vessel if you desire something more elaborate, it may help you as an aid to making Frankincense burning more of a ritual as to make it more sensorily stimulating and purposeful. It helps set the mood and as with most things worthwhile, the more attention you put into it the better may be the results. I usually start by lighting a candle, it’s a statement of intent. The light to focus on and to connect to 'Higher Spirit’. I then light the charcoal disc from the candle as part of the process of transferring your intent, and the Higher Spirit principle from the candle to the disc. It's also a link to the primordial elements of Fire and Earth. It also includes the element Air as it burns in our personal environment, and by inducing and utilising that learned on the Inner plane it also includes the element Water by effect on our emotions, especially those of the higher Spiritual nature. It helps to focus our senses to this purpose, and is a direct link via history to the Spiritual Masters of old and the Wisdom that has transcended history like the use of Frankincense itself. The charcoal discs produced nowadays are self-igniting and as they do so they fizz and crackle due to the Saltpetre (Potassium Nitrate) that is added during their manufacture to assist in their ease to ignite and to evenly burning quality. It is actually best to allow the charcoal disc to sit in the sand or vessel you choose to use approximately 5 minutes to acquire an even covering of pale ash before placing the Frankincense resin on to it. 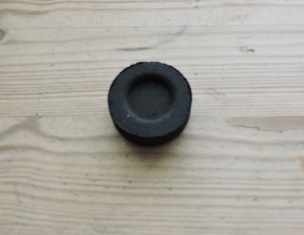 The commonly produced charcoal discs have a dish shape to them to place the Frankincense resin into and depending upon where you source your resin from, you may also need a Pestle and Mortar to break it up somewhat into smaller pieces. 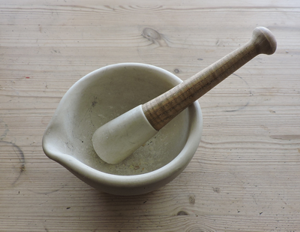 Some Frankincense resin however is softer than others and can even be molded after a short while just by the warmth of your hand and can indeed be too sticky in a Pestle and Mortar, so a small piece/s can be separated by hand and used accordingly. To me, I like the way it also leaves its wonderful 'Lemony' scent on your fingers. Care should always be applied when handling these charcoal discs once lit, if you need to, use some simple tongs when ignited, and tweezers or a spoon for example when placing the Frankincense resin upon them because they get extremely hot! The grades of Frankincense will burn slightly differently and some can smoke more than others. As a general rule if this happens, some sand or salt can be sprinkled onto the disc before the resin to prevent the otherwise pure aromas of the smoke being tainted by over-burning. Boswellian on left and Al Hojar on right. Al-Hojari, Green, or Silver are the best quality Frankincense resins and with experience you will be able to discern this difference in quality. I do believe that the quality of assistance given in the Astral aroma is noticeable as well, this is part of the learning curve that you will notice in the using and the doing. 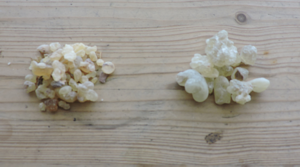 There is a perceivable higher 'top note' to the purer, higher grades of Frankincense resins. As to how and what you meditate upon, or facilitate Frankincense as an aid in the Astral is a personal one to be developed. I have found that the quiet moments when you can relax and slow the metabolism down easily and cerebral/objective thinking, like early in the morning while not properly conscious, or late at night before actual sleep are the best times for this. …Its function is dual. Primarily, because odors are the most etheric of material substances, they tend strongly to stimulate the nervous system. Such stimulation causes the generation of electrical energies which tend to strengthen and build up the etheric forces. Secondarily, if chosen with due respect to their astrological vibrations, they act as agents by which man is more easily placed in rapport with invisible entities having astrological vibrations similar to those of the incense. There is indeed a wealth of recipes for Incenses with Planetary correspondences if you want to pursue them and again the Correspondences for the Major Arcanum in The Sacred Tarot provides keys to this. It’s too a big subject to include in this article and I would recommend starting with Frankincense in its singular use as an ingredient and as a general purpose Incense. 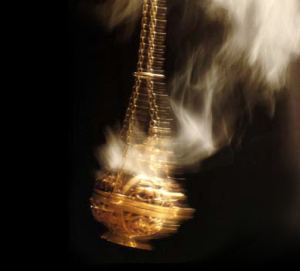 …Symbolically considered, incense represents man's thoughts, and the pot in which it burns represents his body. The fires of passion, or those of aspiration, kindle our thoughts. These, in turn, become burnt offerings either to our lower or to our higher nature. If man's thoughts are kindly and noble they tend to build up his spiritual body; but if they are ignoble and selfish they rise no higher than the astral plane and there distort and disfigure the astral body. When Abel, corresponding astrologically to the moon, and in man to the divine soul, sacrificed his animal passions and creative desires upon the altar, they became an acceptable sacrifice unto the Law. But Cain, corresponding astrologically to Mars, and in man to the animal soul, hoped to propitiate the Law by offers of the fruits of the earth, by offering to buy his way with material things. Zain's words are portrayed in the Constellations indeed, as he assigns Frankincense (and Myrrh) to Aquarius. The first decanate of Aquarius being Equulus the Horse as representing thoughts and ruled by Uranus the Planet of Intellectual ESP on the Astral Plane, being opposite Crater, the fiery Altar , the first decanate of Leo ruled by the Sun representing the Ego, as can be Materialistic or Spiritual as our thoughts and desires are directed on the Physical Plane. You can choose any card and its key words to meditate upon, or one of the Admonitions from the Brotherhood of Light Egyptian Tarot Major Arcana in CS VI Sacred Tarot. You can choose any phrase, paragraph, or topic from all that you've learned from any of the Brotherhood of Light lessons. You can use the Horoscope Program and study your Major Progressions currently in force and print off a relevant Planetary Spiritual exercise to read and concentrate on from the Church of Light website [for example, see Prayers of Purpose]. Also, you can think of your connection to your fellow Stellarians and Hermeticians and the benefit of being a member. Anything that may help you to improve your Personal Alchemy (Brotherhood of Light course 21, and chapter three is particularly relevant here), and then how you may apply this to yourself and in the outside world. I usually allow a few minutes for the smoke to permeate and stabilise in the room before laying on my bed with upper half of my body slightly inclined supported by pillows. Then using slow rhythmic breathing and by technique described in the Fifth Brotherhood of Light 'Not Sold' Award Manuscripts… oh, and practice of course!